Good morning beauties I was going to wait until tomorrow to post this but I just couldn't wait! I've recently discovered Shopcade, a website and app that has completely changed the way I look for new brands and shop for products. Shopcade showcases a range of products from electronics to handbags and downloads to lipsticks. There's quite literally something for everyone on the site so don't be put off by the fact that I'm a beauty blogger! Brands and bloggers alike can easily upload their latest products from any website that you can then 'want', tag a friend or shop for with one easy click, it's super easy to use! New items are found by the Shopcade team each and every day so there'll always be something new and it's great to discover new bands too! By clicking the want button you can add an item to one of your wish lists and you'll get notified when an item on your wishlist goes on sale (or you can just browse their deals here). Adding an item to one of your list also earns you points that can be spent on a collection of rewards and free gifts such as free Body Butter with £5 purchase at The Body Shop (100 points) and Kate Moss Lipstick (20,000 points), the perks you can get change frequently as the site is quite popular so if you don't see something you'd like to redeem just check back the next day! Shoppers can also gain cashback, free products and rewards from using the site! 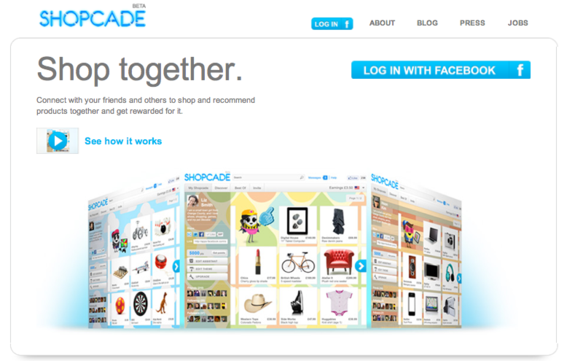 You can download the Shopcade app for free on the iTunes Store or check out my profile on Shopcade.